Many Sciblogs readers will know the work of Dr Ben Goldacre, the doctor, academic, Guardian columnist and author of the best seller Bad Science. Goldacre touches down briefly in Auckland in September for one event at the Mercury Theatre, which if his previous public appearances are anything to go by, will be a funny, enlightening and ironic affair. He made his name for his Guardian columns and blog posts exposing pseudoscience and the media’s own mistreatment of science. That spawned the 2008 book which tapped into the frustration many worldwide were feeling about the various anti-science tropes that kept doing the rounds in the mainstream media and in public discourse at large. Goldacre has never been one to defer to authority or to gloss over the failings of journalists and scientists, which as made for some highly entertaining public stoushes with people in the media, blogosphere and especially via Twitter. He really went for it with Bad Pharma, which highlights the pharmaceutical companies’ track record of burying unfavourable clinical trial results. That work spawned the AllTrails project, which calls for all past and present clinical trials to be registered and their results publicly reported. Helming this dissemination of factoids, Goldacre says, is sensationalistic mainstream media, crooked corporations, and some individualistic, less-than-reliable ‘researchers’. 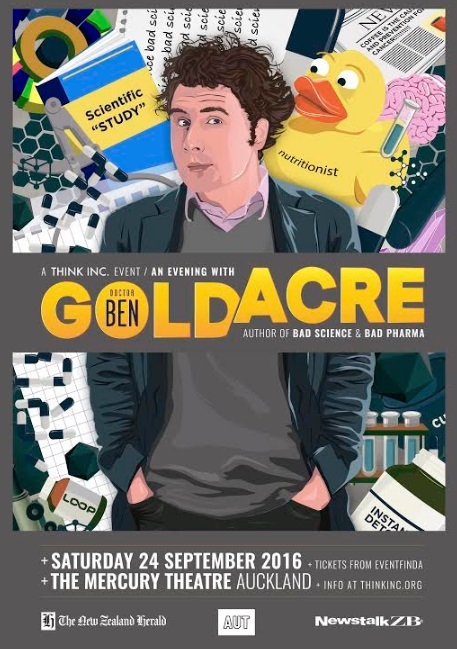 Tickets for Ben Goldacre’s Auckland show are available on Eventfinda. He’s not coming to Wellington? Damn!